I have just got back from the annual Council meeting for the World Business Council for Sustainable Development (WBCSD) where it was good to hear the new President, Peter Bakker, talking about a much more focused and serious response from the organisation to key issues such as climate change. During the week real challenge has come from the likes of Paul Gilding and Will Steffen of The Stockholm Resilience Centre. 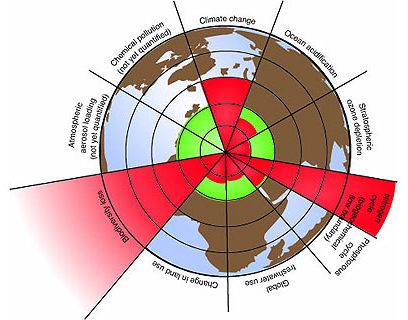 The latter is well known for the development of the Planetary Boundaries framework, which seeks to quantify the limits on a set of critical parameters impacting the stability of the conditions of the Holocene period (which has seen the development of human civilization during a 10,000 year period of relative global stability). Climate change – rather than just measuring this in terms of CO2 in the atmosphere, the metric is the global heat balance. Because of increasing levels of greenhouse gases in the atmosphere, the atmosphere is no longer in heat balance, rather there is more heat coming in than going out. This situation needs to be brought back into check. Biodiversity – this is key to the production of goods and services from the biosphere, including most critically food for human consumption. Introduction of novel entities – this is about the introduction of new “stuff” into the environment. Perhaps one of the best examples of this was the use of Chlorinated Fluoro-carbons (CFC). These offered tremendous economic benefit but with no concept of the damage that would be done to the ozone layer. Will Steffen made an interesting observation about this and noted that we missed a major catastrophe almost by chance. CFCs could well have been BFCs or bromine based. Had this been the case, the more reactive nature of bromine would have devastated the ozone layer by the time the interaction was unravelled, with no chance of recovery. Fortunately this wasn’t the case, but the point was clear. The nine boundaries work still stands and will continue to be critical to their thinking, with this new model more an “aide memoire” to the bigger picture. This was by far the biggest hurricane ever recorded north of the Carolinas. It was driven by increasingly warmer waters in the Atlantic. It should have tracked out into the Atlantic as many hurricanes have done, but didn’t because of a large blocking high pressure system. There is growing evidence that the appearance of such high pressure systems is linked to the change in ice cover in the Arctic. 2012 saw the lowest September Arctic sea ice cover on record. New York infrastructure was built in a different era. Even the 20cms of additional sea level over the past century made a significant difference to the water volume in the storm surge and the consequent flooding of lower Manhattan and other low lying areas. C2ES also released a paper on this subject during the week, which you can view here. Is technology push sufficient as a policy approach? A grim warning about the 2°C target – but then what? 2. Linking the east coast storms to arctics is bit overkill. Two strongest storms were probably at 1635 and 1638 with 1815 adn 1821 tracking. Dou you suggest that the ice cover was even lower than today? 3. 1821 surge was just marginally lower due to several external factors (phase of the moon, low tide etc.) NY was lucky then, unlucky now. However, it is interresting to see grouping of big storms few years apart. Perhaps some natural cycle? Can we expect another big storm in New Your in few years time? Closing note: Observed damage wasn’t that bad. These things simply happens. It’s probably far cheaper to adjust rather than trying to prevent these inevitable storms. There is no climate change from increasing GHGs because the so-called science claiming this is based on two scientific howlers, the incorrect belief from meteorology that the temperature signal a pyrgeometer measures is a real energy flow and adding this to real net IR emission, the claim that the Earth emits IR as if it were an isolated black body in a vacuum. The resulting perpetual motion machine causes imaginary positive feedback and because in reality, GHG IR emission is turned off at the surface, standard heat transfer physics missed by Trenberth et. al., there can be no GHG-AGW. Sorry, you and the rest of those who feed off the imaginary warming scam have been had: the World is cooling.